A fantastic period piece setup for the character. 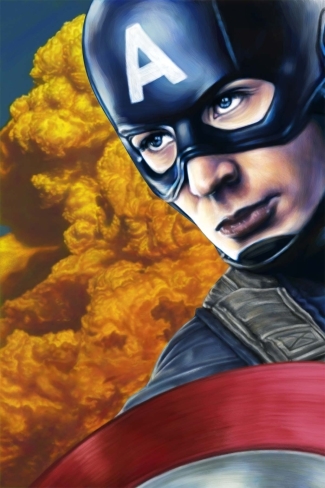 This movie exceeded my expectations - Joe makes the absolute right choices: making this a period piece, making skinny Steve Rogers believable and allowing great insight into what makes this hero. The last half of the movie suffers some timing issues but it's a great launchpad. All the good of RAIDERS and Simon & Kirby. The first hour is golden. I always told anyone that would listen that the perfect Captain American movie had to be set in WWII. Never in my wildest dreams did I believe it would happen. Captain America is the Superman of the Marvel universe. Just as Superman ignited all superheroes (1938) and became their ethical figurehead, Cap became the prime success and moral center for Timely Comics (1941). This was mainly because of his obvious patriotic value during WWII, an association that has helped and harmed the character over time. At his best, Cap is a principled populist. Joe Simon and Jack Kirby, poor NYC boroughs kids who knew too well about anti-semitism, created him as a response to Hitler well before US entry into the war. Their prescient creation was based on the core idea of the decent person, initially frail in body but indomitable in spirit and compassion. He is not nationalistic, but simply humane and just. At worst, Cap has been misused at times as a patriotic prop or as a mouthpiece of reactionary froth. (Superman and Wonder Woman have been caught in this loop at times, too.) With his identity entwined in the nation, he becomes a barometer of its advances and regressions. Captain America is essentially about captaining the American ideals to their best fruition. This film honors this potential in him in multiple ways. Calling him the first Avenger isn't just a savvy marketing set-up for the team film, but a declaration of him as the first superhero, and at heart, the best. This creates the moral and historical lineage that all Marvel heroes will domino from. Smartly, the film spoofs agitprop and ignores irony, instead faithfully positioning him as strong from spirit, nobel from decency, and a leader from reflective wisdom. He isn't any nation's borders or any zealot's limits, he is humanity unbound. With or without the powers, Steve Rogers is, at his core - a super person.